LOUISVILLE (CelebrityAccess MediaWire) — Following a successful date by the Rolling Stones at Louisville's fabled Churchill Downs racetrack, the managers of the track and venue management firm SMG are forming a partnership to try to repeat the magic, Billboard reported. 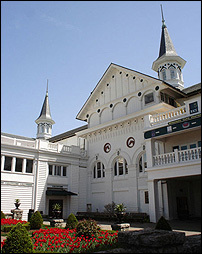 Churchill Downs, which plays host to the Kentucky Derby is spread across 145 acres and can accommodate up to 41,000 music fans in the grandstands underneath its famous Twin Spires and there is room for double that number on the infield of the track, making the facility ideal for festivals and outdoor music events. Additionally, the venue already has the bathrooms, vending stands and other infrastructure that is vital to a successful event. "It works for the artist and for the fans," Mike Evans, SVP of sports and entertainment for SMG told Billboard.biz. "But more importantly, the infield has all the infrastructure that is necessary for festivals and other types of shows. There's power, there's bathrooms, food stands, running water. All the things that people need that festivals typically have to import, they already have in place because they have 100,000 people in that infield for the Kentucky Derby."